What an adorable new children's book from Amy Parker. The overall message is to thank the helpers in the community (officers, teachers, postman, etc), as well as God, for all they do to care of us. I enjoy the rhythmic narrative and the bright illustrations. It is a wonderful boardbook to read at bedtime to young children. 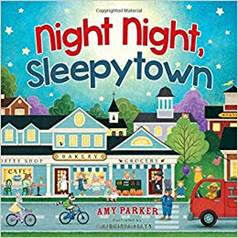 Night Night, Sleepytown (August 7, 2018, $9.99) joins Night Night, Farm and Night Night, Train as the latest ‘night night’ series book. Amy Parker is a bestselling author, who has sold more than 1 million books with HarperCollins Christian Publishing, is taking her sweet bedtime stories to the community. Her newest release, Night Night, Sleepytown, hits shelves August 7. The book features darling illustrations of fire fighters, police officers, and citizens perusing around their neighborhood. Children are invited to say ‘night night’ to each town member. Parker has become a favorite children’s author with both parents and children. Night Night, Sleepytown is a great way adults can teach their little ones about the various community jobs that help our town go round. About the Author: Amy Parker's children's books have sold more than 1 million copies, including two Christian Retailing's Best award-winning books and the bestselling A Night Night Prayer. She lives outside Nashville with her husband and two children. About the Illustrator: Virginia Allyn has illustrated more than a dozen children's books. She lives above a chocolate shop in a beautiful New Hampshire village. She enjoys collecting children's books, hiking, and eating all her vegetables (except peas). Disclaimer: I received a complimentary copy of the book at no charge in exchange for a fair and honest review.